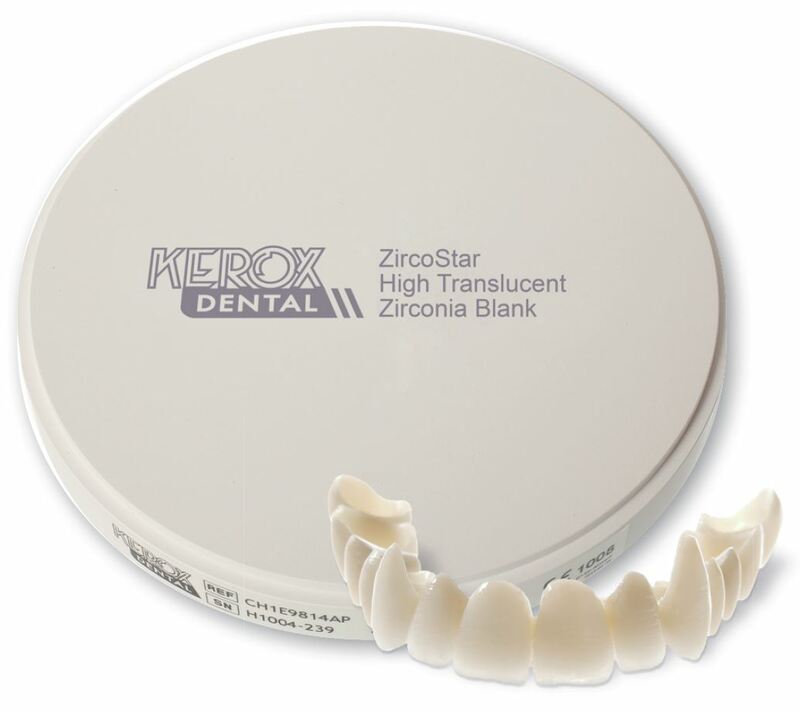 Zirconia Materials – Kerox Dental Ltd.
Ultra High Translucent (UHT) was developed to have aesthetics that re- semble that of natural teeth. Not only does it come with lithium disilicate like translucency, but it’s three times stronger at 1175 MPa. It’s optimal for full contour anterior restorations, but can also be used in the posterior due to the hard density of the material. 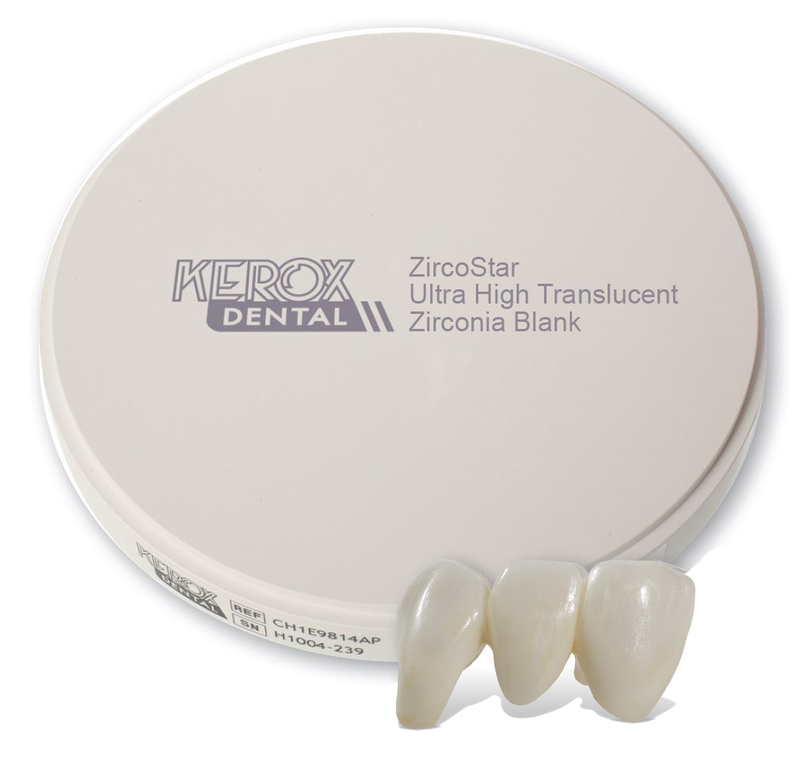 High Translucent (HT) zirconia can be used for anterior and posterior restorations, full contour and frameworks. It has high flexural strength and high translucency. 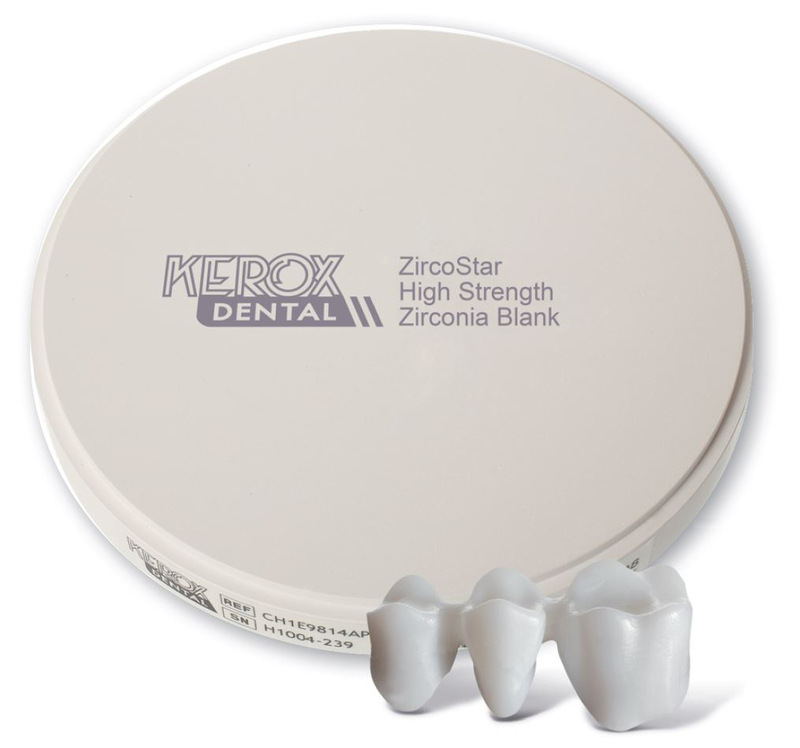 Zirconia manufacturers often refer to Megapascals (MPa) when referring to the strength of their dental ceramic products, however strength can actually be measured in two different ways. MPa is a one time measurement of flexural or bending strength, which is basically how much force the material can take when pressing down from above until it breaks. 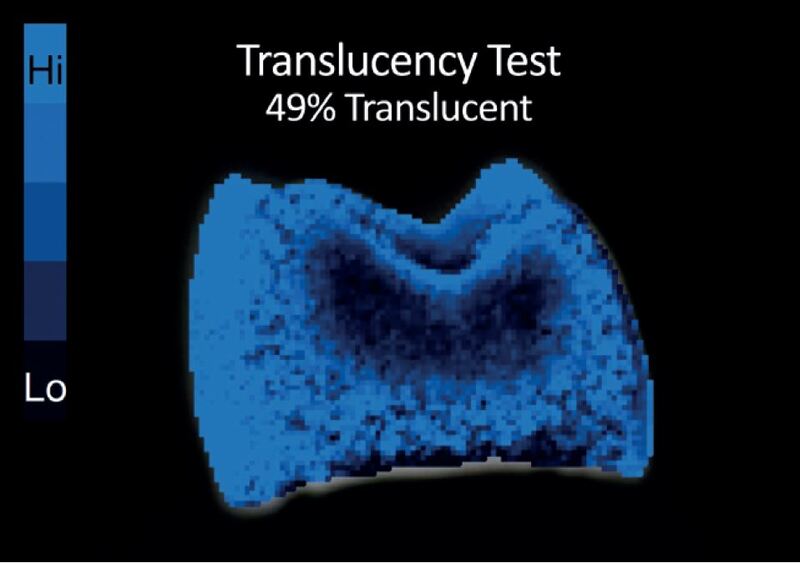 The other measurement of strength which is often neglected and can be considered an even more important discussion point, is fracture toughness. It measures how many times the material can take that force and shows how the finished tooth reacts to repeated pressure and mechanical impact in the mouth. Since we don’t only chew once with our mouths, but many times a day for years and years, a quality zirconia should have a high fracture toughness value. The constant chewing and drinking hot and cold liquids can cause zirconia to shrink and expand, further causing mechanical stress. If there’s enough of these repeated stresses, the material can develop micro cracks and possible chipping – fracture toughness measures how many of these actions the material can withstand before this occurs and how far the micro crack will penetrate into the material. The HT has a greater ability to withstand these micro cracks. If there is a crack, it stops and will not travel across the zirconia and break in the mouth, due to its self-healing properties. This is a great advantage for the dentist and a major benefit to the patient. High Strength (HS) zirconia has optimal milling properties and is recom- mended for porcelain fused to zirconia framework restorations. The material accepts porcelain layering exceptionally well and its low trans- lucency perfectly covers abutments. It comes with an extremely high flexural strength (close to 1500 MPa) and higher fracture toughness for long span bridges and difficult jobs where additional strength is required. High Translucent Multilayer (HTML) zirconia can be used for full contour, frameworks and for bridges. It offers undefinied layers of natural gradient colors from cervical to incisal, and high translucency for life-like esthetics, and high strength for unparalelled mechanical properties. 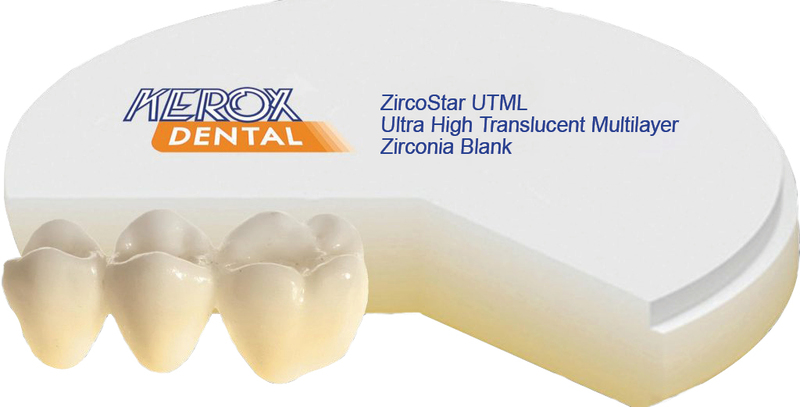 Ultra High Translucent Multilayer (UTML) zirconia. It’s optimal for full contour crowns and bridges up to 3 units for anterior restorations. It offers undefinied layers of natural gradient colors from cervical to incisal, and high translucency for life-like esthetics.